Do you suffer from wrinkles, rosacea, age spots or large facial pores? If you do there is light at the end of the tunnel. With today’s advances in cosmetic lasers and light technology these conditions can be treated in a very fast, safe, painless and effective fashion. Patients seek treatment that offers a return to a more youthful appearance through restoration of even color and smoothness, relief from pigmentary sun damage, and the redness and flushing associated with rosacea. In addition, this patient group requires treatments that are short and pain-free, and allow immediate return to all activities. Following more than 20 years of treatment of vascular lesions using the pulsed dye laser, a new laser-like intense pulsed light (IPL) device was developed that treats these conditions with success and answers the essential lifestyle criteria when used in a carefully administered program. This new IPL skin rejuvenation technique called Photo Facial now has a clinical history of many treatments with excellent patient success. IPL differs from laser light in that, rather than monochromatic single wavelength, IPL emits a non coherent, broad spectrum light. To customize the light energy delivery for a given procedure, the operator employs a light guide, of designated wavelength, below which the spectrum is selectively eliminated. The IPL system, as used in the Photo Facial procedure, conforms to the principle of selective photothermolysis. For dilated vessels, as seen in patients with sun damage and rosacea, the light energy with high absorption by hemoglobin and oxyhemaglobin reaches the dermal capillary bed and selectively destroys the abnormal vessels. The operator controls all aspects of the light pulse, including cutoff wavelength (nm), energy level (Joules/cm2), pulse duration (milliseconds), pulse pattern (single, double, or triple), and delay time between pulses (milliseconds). This allows for precise control of light energy, which in this procedure is utilized for customization for skin type, procedure progress, and other variables. All controls are computer driven. Rosacea is a chromic skin disorder affecting the face, characterized by redness and telangiectasias, and is punctuated by episodes of inflammation with papules, pustules, and swelling. The underlying causes of rosacea have not been elucidated yet. There are four basic stages through which rosacea sufferers may progress: pre-rosacea, mild, moderate, and severe forms. Pre rosacea refers to the stage where a person flushes or blushes to a stimulus, but returns immediately to normal when the stimulus is removed. The progression of pre-rosacea to bouts of flushing and blushing that do not dissipate for hours or days is now considered to be directly related to micro vascular dysfunction or damage. In support of this, leading dermatologists Dr Neumann and Dr Frithz recently reported that biopsies of vascular lesions from rosacea patients demonstrated moderate to severe damage of endothelial and smooth muscle cells. In addition, these same biopsies showed evidence of abnormal fusion of capillaries and angiogenesis. Taken together, rosacea-related alterations in endothelial cells, vascular smooth muscle, formation of new inflammatory shunt vessels, and angiogenesis could explain why the rosacea-related red face, flushing, and blushing worsens over time. In effect, it is plausible that alterations in micro vascular structure and function allow for more intense bouts of blood flow and inflammation, resulting in even more micro vascular damage — a vicious and progressive cycle. Therefore, therapy should be centered around the removal of damaged and dysfunctional micro vessels such that new thicker walled micro vessels with normal plump endothelial cells are laid down. Previous treatment of the acute inflammatory episodes have consisted of avoidance of heat, cold, sunlight, alcohol, and stress. Physicians have used tetracycline’s, dapsone, erythromycin, chloramphenicol, metridonazole, clonidine and Accutane with limited success. Topical treatments with antibiotics, sulfa preparations, and topical steroids have also been used. Indeed, steroid use ultimately compounds the problem by causing more reddening, flaring, and atrophy. None of these treatments remove the abnormal vessels. Electrocautery treats only those larger visible vessels, and not without pain, bleeding, and frustration of both practitioner and patient. It is extremely rare for an IPL patient to experience purpura. Following treatment, the patient may have mild redness and swelling overnight, but daily activities are not affected, and many patients can return to work within a few hours. IPL has demonstrated an improvement in fine lines and wrinkles, as well as reduction in pore size, possibly due to new collagen deposition in the dermis. This technique is not effective for treatment of sagging skin which is normally treated surgical techniques. IPL has also been used effectively to treat psoriasis of the face, to reduce erythematic following laser skin resurfacing, and to treat acne scarring. The Photo Facial technique is a proprietary treatment protocol. It consists of a series of IPL treatments, usually five to six treatments over a period of 4 months. The IPL is performed on the full face. Two-hundred patients with rosacea were chosen randomly by Omlas and evaluated to determine the overall success with the IPL. Patient satisfaction was high with dramatic improvements. The results of this treatment have been truly remarkable. The most difficult patients to treat were those with Fitzpatrick skin type I who have a long history of sun exposure. In these patients, connective tissue is so fragile that IPL parameters selected for optimal relief of redness may damage the skin, with higher incidence of purpura, swelling, and blistering. In such cases, sub optimal parameters must be used early in treatment until the connective tissue supporting the dermal architecture is strengthened and the target tissue is reduced in size. The standard five treatment program is usually extended in this patient group. Working with the constraints of the lifestyles of active working patients requiring brief, relatively pain-free facial treatments with no downtime, the IPL skin rejuvenation technique provides superior cosmetic results. Specifically, the treatment offers relief from the redness and flushing symptoms of rosacea, improved smoothness and texture of facial skin, remove age spots, restoration of even color, and a dramatic reduction of fine lines and wrinkles. See how IPL can help the rosacea on your face. Combination laser and light-based treatments for rosacea have a synergistic effect and are now being studied, according to David J. Goldberg, MD, a board-certified dermatologist in practice since 1985 at Skin Laser & Surgery Specialists. Researchers have been studying the effects of LED therapy and intense pulsed light (IPL) treatments which may help reduce inflammation and even reduce the symptoms of rosacea. Rosacea is a skin disease which left untreated may get worse and lead to complications such as telangiectasia and rhinophyma. In addition to this people who notice unusual symptoms which might be rosacea should see a dermatologist as early as possible. By asking medical help in a short time, the disease can be easily controlled and treated with an adequate treatment. Thirdly, Glycolic acid may be an effective treatment for healing rosacea and it can be found as Glycolic acid peels and Glycolic acid washes and creams. Moreover for the serious cases of rosacea, specialist usually prescriebe a certain medicine called Isotretinoin, a strong medication which even though helps in diminishing nodular rosacea and other skin infections, it can cause severe side effects. Rosacea is a disease that can easily affect the eyes too. A home remedy which brings great results includes cleaning the eyelids with diluted baby shampoo. However, for the eyes infections caused by rosacea are usually used treatments with antibiotics like Doxycycline, Minocycline and Tetracycline. Moreover, in order to reduce the redness and blushing caused by the expanded blood vessels, dermatologists may prescriebe a wide range of methods such as anti-inflamatory medication, electrosurgery (an advanced tehnique which diminish the visible blood vessels), intense light and laser therapy, vascular lasers, procedures which may take more than one treatment. Another procedure used in removing the thicknened tissue which usually occurs on the nose is Rhinophyma. Moreover, physicians may use other precedures, such as dermabrasion, electrosurgery, laser surgery in order to sculpt areas to a natural aspect. Rosacea is a very common skin problem. The effects of Rosacea are very devastating for both men and women. Besides affecting the texture of the skin it affects the looks. Rosacea characteristically attacks the face, but is also found in other parts of the body too. It’s a typical skin disease that causes redness, pimples and pink red lines on the forehead, nose, cheeks, chin and also on the skin of neck. It also cause burning and soreness in the eyes and the eyelids. Rosacea is more common in men and women with fair skin and is common in all skins in sunny countries. Although there are no treatments for Rosacea, but it can be stopped from getting worse by identifying and avoiding its triggers that are responsible for causing Rosacea. It is very important to follow a treatment plan to determine the triggers responsible for Rosacea. The most important tip is to use the right natural treatments. By using the right natural treatment you can reduce or eliminate Rosacea. Clean your face several times a day using a mild cleanser. Wear a gentle sunscreen, when going out. Drink lots of water and spray face with cold water as frequently as possible. Lower down the level of spicy food level. Avoid sun rays and try staying in some shady areas. The sun can aggravate your skin conditions. Add fruits and vegetables to your diet and avoid alcohol, beverages tea etc. Following these steps can greatly reduce the symptoms, but you will need to do more to cure your Rosacea. A healthy life style also plays a part in Treating Rosacea. The good news is that Rosacea is now treatable with some topical antibiotic. But, one of course must consult a dermatologist before going for any ointment or medicines inorder to avoid adverse affects. When it comes to your face, keep in mind, never experiment with it. Your face puts the first impression, so care for it. Treating your face skin with natural tips is the best way to keep away from scars and blemish. Rosacea – Do You Have It? How Can We Know That We Suffer From Rosacea? Rosacea is a serious disease which can bring severe complications if it is left untreated. However, rosacea has specific symptoms which, in many cases, can’t be easily identified and is often mistaken for some other conditions with similar symptoms, such as lupus or acne. Rosacea may appear as an irritation of the skin and the face, which can become sensitive and red causing great discomfort. It is considered that there is an important connection between rosacea and headaches due to the blood vessels. The face and skin become red and sensitive. The facial redness appears because of broken blood vessels which usually expand due to the prolonged exposure to the sun and to the dehydrating effects of alcohol. The most common areas where rosacea may occur are the nose, chin, cheeks and forehead. Men usually tend to have this infection on the nose but in many cases it may appear on the neck or upper chest. Rosacea produces small pimples on the red areas of the skin, pimples which have black and whiteheads and are diferent than the olnes produced by acne. Another symptom of rosacea are the swollen bumps on the nose. 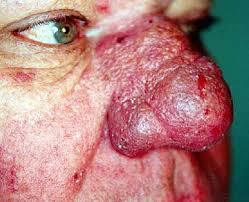 In the severe cases, rosacea may lead to rhinophyma, an irritation of the nose. On the face may appear tiny, thin red lines (telangiectasia) which look like butterflies or spider webs and are caused by the blood vessels breaking. However, rosacea may affect the eyes too and most of the people who suffer from this disease can expect eye irritation and discomfort. In this case, the eyes get irritated, becoming red and dry, and the vision may become impaired. Other symptoms include, crusted mucus, tearing, and feelings of burning and itching. The irritation might extend to the eyelids, in turn, becoming swelled, dry and flaky. Here are some of the common symptoms of psoriasis and other skin aliments. Manuka Honey has been used as a topical agent to treat a wide range of skin problems, including infected wounds, burns, eczema, ringworm, etc. It has recently been gaining worldwide recognition for its ability to draw moisture out of bacterial cells, killing even the most resilient forms of infectious bacteria, including MRSA. It is now recognized that Manuka Honey also has the ability to draw impurities out of the skin, unclogging pores and clearing acne breakouts. It penetrates the blocked follicle, kills the bacteria that cause acne and helps to unblock the follicle allowing the built up infection to be released. This leaves a sterile clear follicle which heals quickly, reducing or even preventing scars from forming. Independent studies have shown that Manuka Honey reduces inflammation and promotes the healing process. Unlike ingredients found in many acne products, Manuka Honey has a very hydrating effect on the skin. It is a known fact that hydrated skin heals better and faster than dry skin. Manuka Honey is regarded as a natural moisturizer. Since it’s a natural ingredient and an anti-irritant, Manuka Honey doesn’t aggravate sensitive skin, which is common among acne sufferers. Manuka Honey is known for its effectiveness as an antimicrobial agent. This makes it useful for treating acne breakouts because it prevents bacteria from growing. The acidic environment of honey is not an ideal environment for bacterial growth. Honey is also low in protein which deprives bacteria of nitrogen, an element needed for bacteria to grow. With infection-causing bacteria eliminated, redness associated with acne is also eliminated. In addition, Manuka Honey’s anti-inflammatory properties help to eliminate inflamed tissue that may be causing pain or discomfort. A New York-based manufacturer of skin care products called Honeymark has combined the formulation of a powerful acne cream with the potent healing properties of active Manuka Honey. Honeymark’s Acne Cream contains a medical-grade Manuka Honey that quickly goes to work on pimples yielding immediate results. "Manuka Honey’s antibacterial properties penetrating deeply into the epidermis, killing bacteria and relieving blocked follicles," says Frank Buonanotte, CEO of Honeymark International. "The moist healing environment created by Manuka Honey allows new skin to grow flush with the surface of the skin which prevents scarring or skin deformity in more serious cases of acne." For more information or to purchase Honeymark’s Acne Cream with Manuka Honey, call 1-866-427-7329 or visit www.HoneymarkProducts.com. There is no cure for rosacea, but one of the best way to control flare-ups is by following a rosacea diet. Rosacea is a condition that affects more than fourteen million people, especially those of Celtic ancestry. Though it mimics acne rosacea is actually an untreatable condition that may be linked to a problem with the blood vessels, though research is ongoing. There are three ideas on what causes rosacea: a defect in the blood vessels of the face, a bacterial infection, or stomach problems (a lack of stomach acid). Regardless of the cause, it is proven that certain items like hot beverages, spicy foods, and alcoholic drinks trigger flare-ups. During a rosacea flare-up, the skin in the T-zone of the face, including the cheeks, nose, and forehead, becomes rather rough and very red. For some the blood vessels actually appear on the surface, and for others the skin looks much like a bad case of acne. Rosacea can be mild, moderate, or severe, but regardless of the status, it is important to lessen the flare ups by following a specially formulated rosacea diet. Then thinking of foods to add or take from your daily diet, the following list are very beneficial to a rosacea diet. These foods are common triggers or helpful to reduce the symptoms that come with a rosacea flare-up. Spicy foods are often linked to rosacea flare-ups, so hot sauces, spices, and peppers should be used sparingly. If this makes no noticeable difference, then the odds are high that you are not affected by spicy foods and you can return them to your diet without issue. Alcoholic drinks are a big no-no for those with rosacea. Some, however, have a hard time giving up a glass of wine, mixed drink, or a cold beer once in a while, so if you cannot drop the alcohol completely, moderate how much you are drinking. Proteins found in dairy products, meats, and eggs can also cause rosacea flare-ups. Limit your intake of meat and dairy as much as possible because there are fatty acids in the protein that can stimulate the irritation that comes with rosacea. Fat-free dairy products contain less of this fatty acid and are generally better to use. Finally, one of the best things you can do for your body is to drink a total of 64 ounces of filtered water every day. The water will help remove impurities in the body that can lead to infections or help produce the bacteria that may cause rosacea to flare up. By altering the foods you eat, you can quickly learn a rosacea diet that works for you! Rosacea diet (low carb diet)? I ‘m thinking if low carb diet will damage my liver, that’s what I’ve learned in bio class that when no carb is available for energy, our body will somehow digest itself, first something of the liver , then heart and muscle. Also, a diet rich in multiple vitamins and minerals, especially vitamin A, has show to benefit rosacea and acne rosacea sufferers. If you are a smoker, it is imperative you quit. Smoking can aggravate rosacea, and causes problems with circulation, which can lead to other skin problems. Dietary Changes for Acne Treatment? Diet has been implicated in both the cause and the treatment of Acne for many years – but how much of this is folklore? We report on the latest scientific findings on dietary changes and nutritional supplements that may be beneficial for acne sufferers. Acne, pimples or "zits" as many sufferers call it, can be a real cause for depression. It is the most common of all skin diseases with around 17 million people in the USA alone afflicted with an acne problem. The official term, Acne Vulgaris describes a condition whereby the sebaceous glands of the skin become inflamed. If proper acne treatment is not sought these may develop into unsightly pustular cysts, and the end result may be permanent acne scars. The causes of acne are varied and may include hormonal activity, stress, accumulation of dead skin cells and allergy to bacteria which are present in the pores of the skin. Sometimes it is a reaction to anabolic steroids and medication containing halogens, lithium, barbiturates or androgens. Some research suggests a role for food allergy, in the development of acne which implies the elimination of trigger foods could be helpful in the treatment of acne. There are two types of acne: acne vulgaris and acne rosacea. Acne vulgaris is usually a bacterial infection of cysts deep within the skin. This could cause acne scarring if left untreated. Acne rosacea is a chronic inflammation of the cheeks, nose, chin, forehead, and eyelids. These show up as red eruptions. The teenage years seem to be the most troublesome for acne sufferers but it can also occur in adulthood and well into middle age. The skin is the largest organ in the body and a healthy nutrient intake may improve its tone and quality. Although a diet of fried food, chocolates and other junk food does not directly cause acne, there is evidence that changes in diet may be helpful in the treatment of acne. A study conducted by the US Colorado State University showed a link between refined carbohydrates and processed foods like sugar, white bread, pizza, cake and pastries, and acne. These cause a series of reactions in the body that increase the production of acne-causing bacteria. Refined carbohydrates also cause the body to produce a high level of insulin which increases the production of male hormones that cause acne. A decrease in your intake of refined carbohydrates may be beneficial in the treatment of acne. Instead try to include more whole grains, pulses and complex carbohydrates. Furthermore it is now thought that obesity and insulin resistance may also play a role in the development of acne so dietary changes to assist in achieving an ideal weight are likely to be beneficial to the treatment of acne. There is some research linking higher milk consumption intake to acne. If you normally include large amounts of milk in your diet, you could try reducing this and seeing if this is an effective acne solution for you. Ensure you include other calcium rich foods instead such as green vegetables, fish with soft bones, almonds and soymilk. Omega 3 fish oils and antioxidants vitamins may also be important. Vitamin A (also in the form of beta-carotene which is converted in vitamin A) is thought to reduce acne symptoms. It is involved in strengthening the protective tissue of the skin and reducing sebum production. Additionally it helps in maintaining and repairing skin tissue and increasing toxin excretion which may be an important part of the acne solution. Chromium supplements may be a useful adjunct in the treatment of acne via the role in clearing infections and preventing further breakouts. Zinc is a good antibacterial agent; it helps control the oil-producing glands of the skin. Eating zinc-rich foods could help in reducing acne, such foods include red meat and offal, pumpkin seeds, and mushrooms. A role for vitamin E in the treatment of acne has also been suggested due to its anti-oxidant action and regulatory effect on vitamin A levels within the body. Vitamin E requirement can be easily met through natural sources such as almonds, corn, eggs and leafy green vegetables. However you can also try supplementing with synthetic forms and monitor any changes in your acne. One of the most important aspects of your acne treatment is to drink at least eight glasses of water. This cleans the body of waste and keeps it free of toxins. Water helps in circulation, digestion, absorption and excretion. Unfortunately changes in diet alone may not provide a total acne solution. There are a variety of drugs available for the treatment of acne, in addition to an array of natural remedies. It may be advisable to visit a dermatologist for a proper consultation in conjunction to any dietary changes you want to introduce. Mitamins’ aim is to custom-made the best natural remedies to complement the treatment of your concerns. Our unique process allows you to combine multiple formulas into a single formula, in a single bottle, and avoid overdose and interactions. Rosacea is a facial skin condition that is commonly misdiagnosed as acne, and we all know how emotionally as well as physically crippling acne cane be, it can seem like a curse. Rosacea is a long lasting condition that can get worse over time without treatment. People with Rosacea commonly have broken blood vessels, redness and small bumps on their cheeks. Things such as the sun, heat/cold or wind exposure can aggravate Rosacea therefore long exposure to these things should be avoided whenever possible. Other things that are known to aggravate Rosacea are certain types of foods, medications and cosmetics especially greasy products. Rosacea symptom 1 – Dry red eyelids. Rosacea symptom 2 – Irritated eyelids and eyes. Rosacea symptom 3 – Sometimes they can have itching and burning sensations. Rosacea symptom 1 – Some permanent redness to the facial skin. Rosacea symptom 2 – Red bumps called papules. Rosacea symptom 3 – Sometimes these red bumps are filled with pus and are called pustules. This can be confused with regular acne. Rosacea symptom 1 – Thickened and irregular skin surface usually of the nose but can appear on the chin, cheeks or even ears. Rosacea symptom 2 – Enlargement of those sections mentioned. Rosacea symptom 3 – Blood vessels can sometimes be seen close to the surface of the skin in the effected areas. 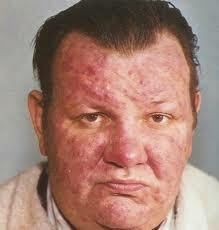 Rosacea symptom 1 – Permanent redness of the skin on the face which can flare up flushing the face very badly. Rosacea symptom 2 – Commonly blood vessels can be seen under the surface of the skin. Rosacea symptom 3 – Can be accompanied by itching and burning sensations. Ocular rosacea is not dangerous, but in rare cases it can travel to the cornea causing infections and problems with the inner blood vessels. Keeping eye drops on hand for the sensation of dry eyes is extremely helpful, but consultations with medical professionals who are well familiarized with ocular rosacea are critical. When ocular rosacea flare-ups occur, a warm washcloth across the eyes can help reduce the pain of inflammation or from styes. Doctors may prescribe oral antibiotics to treat the infected oil gland. Often, using eye drops to alleviate the itchy or dry sensation helps and then the warm compress and antibiotics will take care of the other symptoms of ocular rosacea. It arises later than acne dose, usually when patients are between the ages of 30 and 50 years. 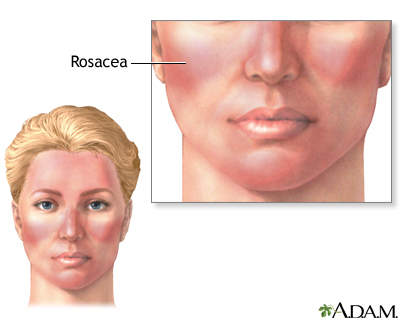 Rosacea occurs most commonly in fair-skinned people of northern European, particularly Celtic, descent; it is unusual among dark-skinned people. Women are reportedly three times more likely to be affected than are men. Clinically, rosacea is a facial eruption that consists of erythematous papules, pustules, and telangiectasias. Lesions are most typically seen on the central third of the face-the forehead, nose, cheeks, and chin (the socalled flush/blush areas). Rosacea lacks the comedones ("blackheads" or "whiteheads") that are seen in patients with acne vulgaris. In general, it does not scar or present with nodules or cysts, unless the patient has concomitant acne. Rosacea lesions tend to be bilaterally symmetric, but they may also occur on only one side of the patient’s face. Your Complexion Rosy has turned into a Red Face? We now know that this idea has been very unfair, and that most people who have a red nose (and sometimes red cheeks and a red chin) are simply afflicted with rosacea. What is the Difference Between Rosacea and Acne? Rosacea is a skin disease that is prevalent with the people who are very fair. Red patches appear on the nose, face, forehead, and cheeks and is known as erythema in this stage. Face Doctor’s Herbal Rejuvenating Soap is truly an amazing product – one that I never want to be without. It cleared up my rosacea in just three weeks. No longer do I suffer with rosacea’s symptoms of red cheeks, papules, and pustules. If you suffer with rosacea symptoms, you might just want to know more about this wonderful skincare product. I will tell you what I know about it, but first, let me explain how I found out about Face Doctor Herbal Rejuvenating Soap. When my dermatologist first diagnosed me as having rosacea, I panicked because I knew that the symptoms of this facial skin disorder sometime worsen. The news wasn’t easy for me to accept as I’d never had a problem with my skin before this. The tube of topical medication my doctor sent me home with did help clear up my skin, but I wasn’t happy with its ingredients because they weren’t natural. As I usually seek out natural remedies for my ailments, this case was no exception to the rule. So, I searched the internet and found a list of distributors for Face Doctor’s Herbal Rejuvenating Soap and called one of the toll-free numbers to find out more about this product. After having all of my questions answered, and after doing more research on what causes rosacea, I placed an order for one bar of soap, hoped for the best and (in my opinion) got it. Rosacea Soap Treatment Rosacea is a horrible frustration for those who are afflicted with it. While its not a threat to ones life, it is a terribly embarrassing affliction and it can make one feel terribly unattractive. It’s not advisable to head for doctor’s prescribed products since they mostly leave the skin, unattractive and dry. So, always prefer the skincare products, especially the herbal ones which adopt a natural method for skin treatment.